Now that the Thanksgiving holiday is upon us, it is once again time to give thanks for the many blessings and benefits that are ours. 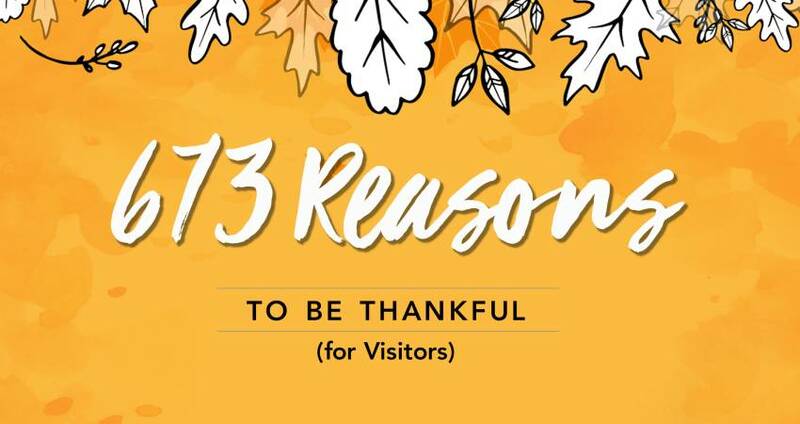 For those of us who live in Wake County and work in the tourism sector, we should pause for a moment to be grateful for the many visitors to our area. It sounds schmaltzy, but it&apos;s true. Here are 673 reasons to give thanks this holiday for visitors. If you are reading this blog, in all likelihood, you are employed in the hospitality industries in Raleigh/Wake County. It is good once in a while to remind ourselves that it&apos;s visitors who allow us to have jobs. Our 2017 statistics tell us that 36,456 people in Wake County are employed full-time (in the hospitality industries or in related industries) strictly because we attract visitors and their spending here, and these local workers earn a payroll of more than $1.2 billion a year because of visitor activity in the county. (Directly in the hospitality industries alone, the Wake County figures are 26,170 jobs and $739.5 million, respectively.) And having a good job is always something to be genuinely grateful for. The local tax revenue that comes from the money that visitors spend here is reinvested in some of the venues and attractions, assets and amenities that make Raleigh, N.C., an enviable place to live and play. For example, visitor-related taxes forming the interlocal fund have been designated for Duke Energy Center for the Performing Arts, Five County Stadium, Fleming Loop Park, Halle Cultural Arts Center, Marbles Kids Museum, N.C. Museum of Art, PNC Arena, Raleigh Convention Center, Ting Park, USA Baseball National Training Complex, Wake Forest Renaissance Centre for the Arts, WakeMed Soccer Park and many more. If you are taking in a hockey game, an exhibit or a show this weekend, don&apos;t forget to tip your hat to the visitors who helped make it possible. Each of these 671 reasons represents a dollar that the average Wake County household saved on its own state/local taxes due in 2017 because of visitors. I don’t know about you, but at my house, $671 can go a long way and will take care of a lot of my holiday shopping. When you are celebrating this season, thank a visitor for putting money back into your pocket to allow you to check items off your gift list or serve a hearty meal. It is easy to let these moments go by and not stop to be grateful for what we have, but we would we miss these things if they were gone. If you come upon a car with an out-of-state license plate this season, honk and wave. Say thanks to those who spend time (and money) in Wake County to make so much possible for us.